The Lower Mill site is comprised of nearly 12 acres and four M-1 zoned industrial lots, 6.5 miles south of Hood River on Hwy 35. These lots are fully served by utilities and 3 of the 4 are shovel ready. Please contact Anne Medenbach to discuss pricing. In August of 2015, the Port of Hood River purchased a nine-acre brownfield located at the site of the former Lower Hanel Mill, in Odell (“Site”). The goal of the purchase was to clean up the underutilized land, create four buildable lots, and return the site to productive use by the private sector to create jobs, and meet the area’s unmet high demand for industrial properties. 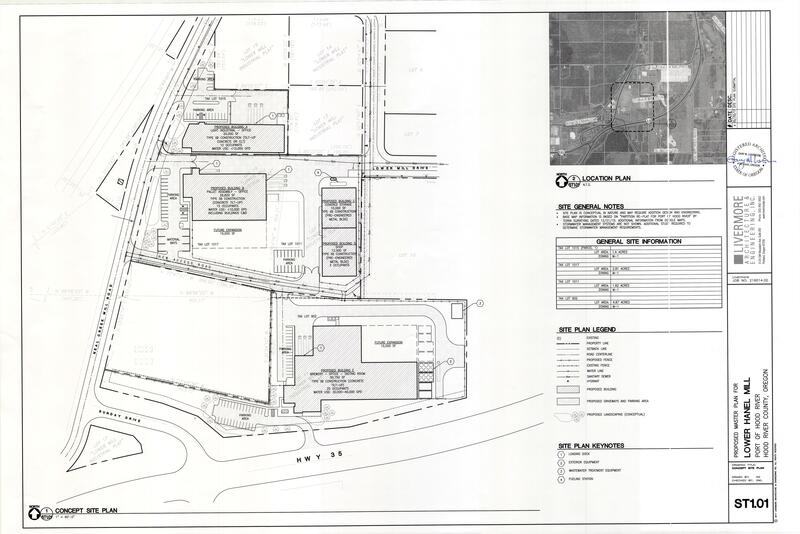 To download the site plan, click here. The Port of Hood River was awarded a grant to fund a portion of the work through the Oregon Brownfield Cleanup program in partnership with the Environmental Protection Agency, Department of Environmental Quality, and Business Oregon. The clean up work was completed in August of 2016. Utilities were installed to each lot and completed in July 2016. Also in 2016, and additional 2.35 adjacent acres were purchased and added to lot 902. Unforeseen water pressure issues delayed lot sales, and the Port spent 18 months working with Crystal Springs Water District (CSWD) to resolve them. The Port was successful in completing a 1,350 LF installation of 10” watermain for CSWD and the water pressures and flows have been confirmed to meet Fire code and building department requirements. The largest lot, 902, is currently being graded and excavated material from the initial clean-up is being moved off site to be used as agricultural amendment on the airport. There is a wetland on this lot as well that is currently in a permitting process with the Department of State Lands.